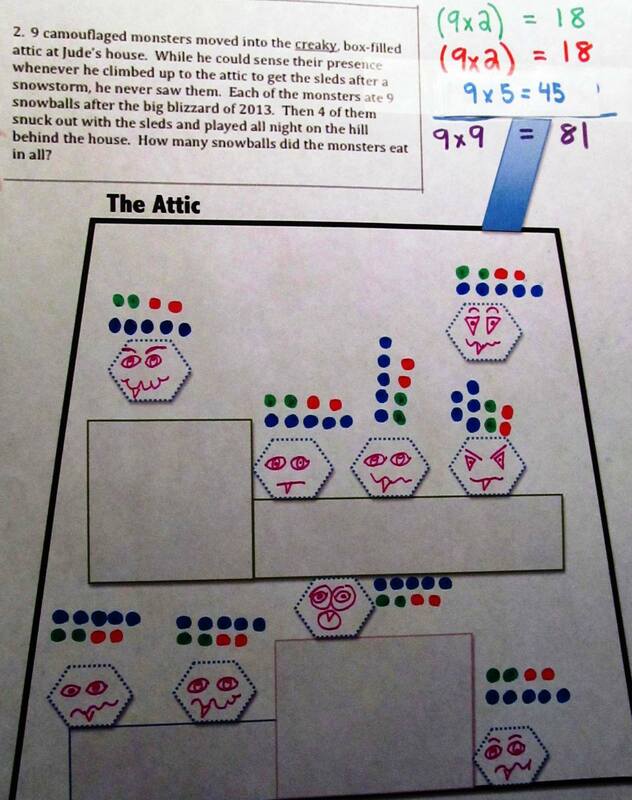 Independent Practice - Create Your Own Monster Math Stories! Students will be able to attend to precision in solving multiplication story problems, and persevere in reading carefully to find the necessary information and eliminate irrelevant details. Close reading skills are needed in math, too! Today our lesson is multiplication word story practice with the basic multiplication facts up to 100. The work requires that students attend to precision and eliminate extraneous information in each problem. I created imaginative short paragraphs to assist my students in persevering in finding the information they need to solve the equation. It is my expectation that my students can define vocabulary words using context clues. A short glossary is provided at the bottom of the 2nd page of the worksheet to assist ELL students. 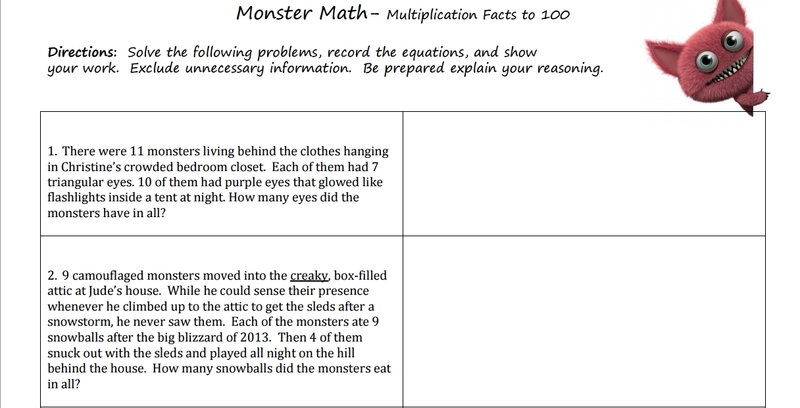 Students will need to work through at least the first four problems in Monster Math Multiplication Stories as part of a whole or possibly small group. The vocabulary is high and there is unnecessary information embedded into the problems as well. After that, there are several ways to approach the remaining problems. This is a lesson in which I find that drawing color pictures as we solve the problems, and projecting them using a document camera, works well. Here are models that can be projected if you do not wish to draw your own monsters! These are model images for questions 1, 2, 3, 4, 5, 6, 7, 8, 9, and 10. * Note to the teacher! There is no multiplication problem to solve in #4. Students just need to read carefully. Most of them will try to create a multiplication problem out of nothing, because this is a page on multiplication. I circulate while students are working on the remaining problems but I deliberately try not to assist students, unless the student is at a dead end. Productive struggle is a good thing! The math fact knowledge required to create equations and solutions for these monster math stories is at a 3rd grade level, but the wording of the stories themselves is more sophisticated. My goal is for students to persist in solving a problem (MP1) even if they don't understand all the vocabulary in the math story. These stories contain some high level vocabulary but it is possible to solve the problems without understanding all the words. 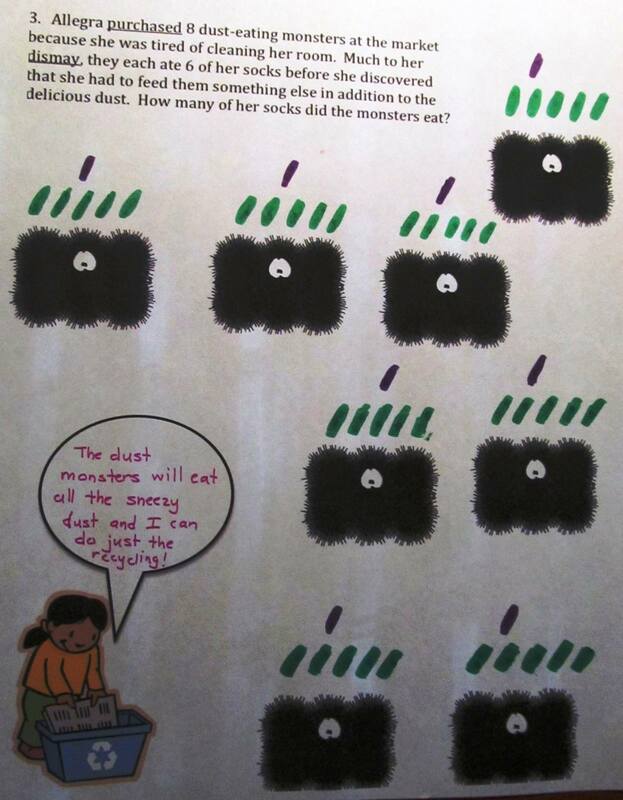 Reading for what is important, and using context clues to solve the rest, is an important life skill and is embedded in the multiplication word story work here. I don't expect students to practice strategies they haven't been taught. If students have not been practicing close reading, crossing out extraneous information, and reading a word problem more than once then they made need more support throughout the rest of this activity. In that case, pull them back as a group. Students are often in a rush to finish their work, and problems such as these reinforce the need to slow down and think it through. If they just skim the problems and look for the numbers, it will not necessarily lead them to the solution. If they read carefully, and cross out the irrelevant information, the actual math itself is not complex. I use grammar mini-lessons and integrated grammar to help my ELL students AND all students read grade-level text with purpose and understanding. Students are told not to add in extraneous information until their problem had been checked by two peers, or the teacher, to make sure the problems have all the required components. Those who were ready to do this on their own stay at their seats, and I call students who need a bit more scaffolding to the carpet and we write a few together. I do this by suggesting details to keep the task moving, and then use their ideas to fill in the blanks. For these examples, I don't add in extraneous information. 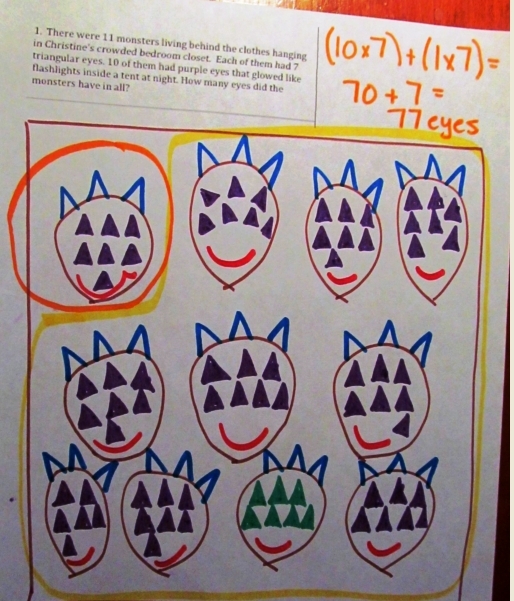 I have another page of Monster Math Multiplication Word Problems stories that I use with my more advanced students who are ready to proceed with this kind of challenge on their own. After they create their story problem, they work on this page alone or in a partnership. You could also use this as Homework. At the end of the lesson time, I ask my students to give an example of a problem in which they found it difficult to eliminate the unnecessary information, and then to explain how they resolved their confusion. They discuss this with a partner. For those who are having difficulty articulating that rather complex thought, I ask them to explain in their own words why it's important to read word problems carefully, and perhaps point to an example we had done in class. If they answer, "To get it right", I prompt them to tell me more using "how" and "why" questions.